It turns out that 18th-century pirates liked to curl up a with a good book. In 1718, Queen Anne's Revenge -- the flagship of the infamous pirate Blackbeard -- went aground offshore of North Carolina. The wreck was found in 1996, and last year conservators discovered a mass of wet textile pieces inside a breech-loading cannon. 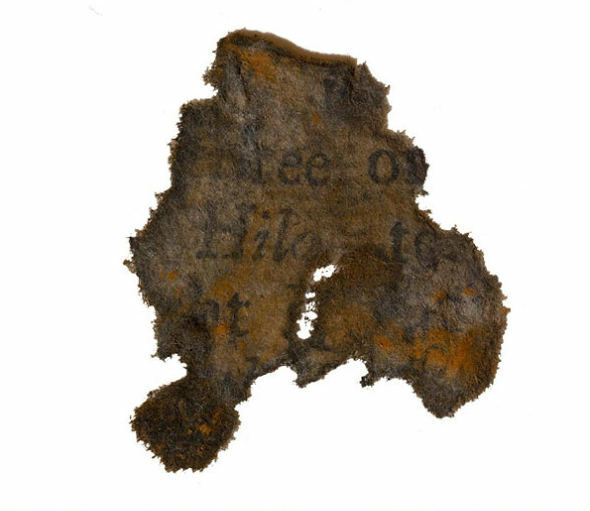 Several of the scraps were printed with uniformly-oriented text, and the conservators realized they'd found tiny fragments of a book. But which book could it be? After a lot of head-scratching, one clue finally helped them figure it out: The piece you see above, with the word "Hilo" in italics. It referred to Ilo, a Spanish settlement in Peru -- which is talked about in the 1712 tome A Voyage to the South Sea, and Round the World, Perform’d in the Years 1708, 1709, 1710 and 1711. Stories about the plunder of Spanish holdings were popular in the 17th and 18th centuries, says Kenyon. "The English audiences were eating this up." The entire text of A Voyage to the South Sea is beautifully scanned at the Internet Archive, so you can spend tonight reading the same book Blackbeard's minions were perusing when they went to a watery grave.